Book-– Many are familiar with Ehrenreich’s Nickel and Dimed, a journalistic experiment in which Ehrenreich take a series of low-wage jobs to investigate the difficulties faced by the working poor. Bait and Switch is a lesser-known companion to this book and explores the raw deal faced by the white collar unemployed. Ehrenreich gives herself 10 months to find a white collar job (defined here at $50,000+ per year, full time with benefits) which is the average length of time it takes most white collar job seekers to find employment. She will then work that job for about three months and do an insider report on corporate culture. What follows is a series of shifty career coaches, wardrobe updates, endless resume tweaking, networking events, and endless web-searching, and no job to show for it at the end. While I can see how this book might be a cathartic read for a white collar professional struggling after a lay off, I think Ehrenreich’s work suffers from going into her job search with all the wrong motives. I felt that Ehrenreich’s insulation from the real-life consequences of her simulated unemployment causes her writing to be permeated with smug coldness, especially when describing her fellow white collar job seekers. She lacked the compassion for the corporate job-seeker’s plight that would have humanized this book. Nevertheless, Bait and Switch stands well as an indictment of how difficult it is to enter (and re-enter) the corporate world, especially as a middle-aged woman. However, I think the work would have been even stronger if either written by an actual laid-off corporate employee or if Ehrenreich simply chronicled the journey of a white collar job seeker instead of going undercover and shoehorning herself into a story that’s not hers to tell. Audiobook – I could recommend the book version of this title, but I won’t. Don’t get me wrong, the paper version of Norse Mythology is not in any way bad; it’s beautifully written, lyrical and fascinating, every bit what you’d expect of America’s leading myth-drenched fantasy writer retelling the tales of his favorite pantheon. But a large part of the charm of the book is its essentially aural nature. This is a text that is written to be heard, prose as hyper-aware of its cadence and meter as any poetry, and the voice it’s written for is the author’s own. So do yourself a favor and borrow the audiobook version instead of the paper book for the full Neil Gaiman experience–unless, and only unless, you plan to read it aloud yourself to a very lucky loved one. As a book, Norse Mythology does exactly what it says on the cover: it retells sixteen of the most important myths from the Norse tradition. As a kid I devoured every scrap of Greco-Roman mythology I could get my hands on and had a fair grounding in the Egyptians, but the Norse myths were somehow more intimidating, hedged in with unpronounceable names and grim doomesday scenarios. This is the book I wish I’d had then–once again, especially with the audio version to make those names a little less scary. I’d be most eager to hand this book to anyone looking for a basic grounding in the subject, but the writing is so lovely that I think it’d be enjoyable even for a reader already familiar. Accessible and timeless, it’s a book destined to preserve its popularity for many years to come. P.S. Gaiman’s breakout mythological hit, American Gods, is premiering as a TV show on April 30, so if you haven’t had the utter delight of reading that novel, now is the perfect time! Book – The Lufthansa Heist reveals the details of one the biggest heists in history. It tells the story of how a group of thieves stole over $6 million from the Lufthansa air hanger vault at Kennedy Airport without anyone ever being charged for the crime until 2013. Henry Hill a known criminal who associated with New York Mafia figures tells the story of how it all happened. Most readers will remember him as the character Ray Liotta portrayed in the movie Goodfellas. In fact the heist is a major part of the movie and eventually leads to the downfall of Hill. In the book Hill gives the reader a more in depth look into how the heist happened and its aftermath. There schemes included college basketball point shaving, drug trafficking, assault, robberies, and murders galore. The story is fast paced and will keep readers intrigued even though most will know the outcome, assuming they have seen Goodfellas. This book will give you what the movie mulled over for lack of time. Listening to the audiobook made things a little difficult however. The narrator has a heavy New York accent which made it difficult to keep up. This is because the story is being told from various perspectives. Even with the difficulty keeping the characters straight, due to the heavy accent, I enjoyed the book immensely. He does a good job at keeping a fast pace as I feel one would have if they were reading the book. The book is for anyone who enjoys true crime, mafia stories, and are fans of Goodfellas and mob movies. Book- This collection is comprised of fourteen stories revolving around themes of immigration, travel, and drifting throughout North America. As an immigrant herself from the UK to Canada, Donoghue has a particular emotional insight into these topics. 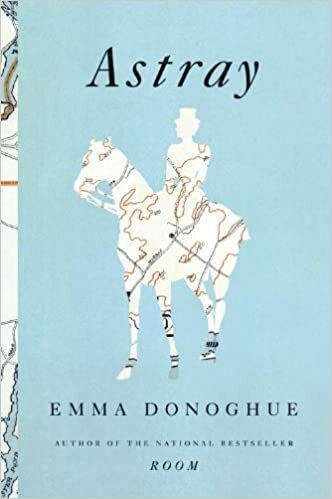 Emma Donoghue’s short stories (and, in fact, her novels) often stem from a small historical detail, such as the 1864 murder of a slave master by his slave and mistress, which becomes a fleshed out story, as in “Last Supper at Brown’s” in this collection. Particularly strong stories in Astray include “Man and Boy,” which chronicles the relationship between a zookeeper and his elephant, “The Hunt,” where the topic of war crimes during the Revolutionary War is explored, and, my favorite, “Snowblind,” which details the harsh first winter of two gold mining partners in the 1890s. The audiobook version of Astray is a real treat, with several different narrators throughout to suit the disparate characters, and a part at the end narrated by Donoghue herself sharing the process by which she developed each story. I found that on audiobook, the stories were a perfect length for a shorter drives so you don’t have to keep jumping in and out of the plot as you would with a novel. These stories will appeal to fans of other historical fiction with keenly observed details, such as The Master Butchers Singing Club by Louise Erdrich. Book – What do a PhD candidate and a gang leader have in common? They both have a vested interest in the life of gang members and their actions. Sudhir was a graduate student at the University of Chicago during the late 80’s and throughout the 90’s. 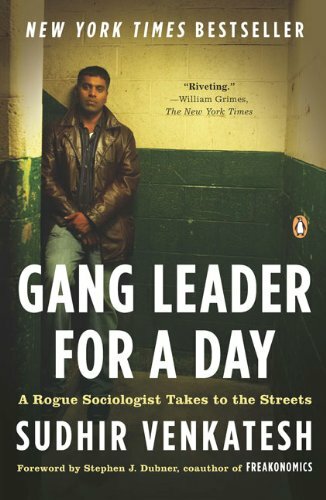 In Gang Leader for a Day Sudhir befriends J.T., the leader of the Black Kings, a gang on the Southside of Chicago. The two have a chance encounter when Sudhir is trying to get surveys filled out by tenants at a Chicago projects high-rise. This meeting will lead them to develop an interesting relationship that will span over 10 years. J.T. shows Sudhir what it takes to lead a gang and how the gang operates. Sudhir learns that gangs are structured and operate very similar to most corporations. The major difference being the products (drugs), and employee discipline delivered when gang members do not meet organization expectations, which comes in the form of violence. Sudhir broke the mold for sociological studies when he performed this research. Normally sociologists use surveys to collect data on why subjects feel the way they do. Sudhir decided to immerse himself in gang culture in order to find out what gang life was like, how the community dealt with the gang, and why J.T. returned to the gang life after having attended college and a job at a downtown business. Sudhir also develops relationships with several community members and leaders allowing Sudhir to obtain a better understanding of life in the projects of Chicago’s Robert Taylor homes. I listened to the audiobook and would like to recommend it for those trying audiobooks for the first time. The reader had a voice that made me want to listen and kept a good pace. Audiobooks can be tricky because many factors will affect the listener’s experience. Readers with interest in true crime, gang culture, and sociological studies will enjoy this book.